The video game era began in 1972 with the release of the Magnavox Odyssey, an at-home game console with primitive games consisting of nothing more than dots and lines – but nonetheless the world’s first home video game. In 1966 Ralph Baer, Chief Engineer for Equipment Design at the defense contractor Sanders Associates, began work on a new training tool for the military, one that could be interactive and a test of skills. He created a technology where a simple game could be played on a television monitor. One year later the work came to full fruition, when Baer and his team created a the world’s first video game, consisting of two dots chasing each other around the screen. The top secret project became known as the “Brown Box,” named for the wood that encased the console. The government continued funding the project as Baer’s team continued their innovations, improving the technology and adding to the Brown Box’s interactivity with the creation of the very first video peripheral – a light gun that could work with the TV system. The plan to use the Brown Box for military training didn’t quite work out. Six years later the top secret status was dropped and Sanders Associates licensed the technology to electronics company Magnavox. The Brown Box was renamed the Odyssey, slightly redesigned and released as the very first gaming console system for the home market – and an industry was born. The graphics the Odyssey offered were simple white dots and lines, with a base game derived from ping pong, with the dots batted back and forth by controllers. The games had no background graphics, just a blank screen. To enliven the look, the Odyssey came with transparent screen overlays in a variety of colors, which the player stuck to the TV screen as color backgrounds for the games. Some of the games, such as ping pong, could be played without a background, while others required the overlays to play. In March of 1972, Magnavox presented the first Odyssey video game to large groups of Magnavox dealers in several US locations – marking the official launch of home video games nationwide. 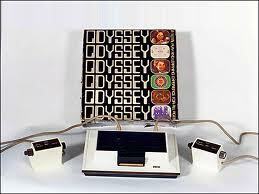 Magnavox would sell nearly 100,000 Odyssey video games by the end of 1972. In 2006 President George W. Bush would present Ralph Baer with the National Medal of Technology award for inventing the home video game console.